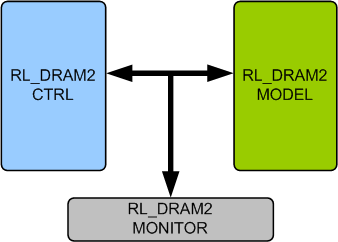 RLDRAM2 Memory Model provides an smart way to verify the RLDRAM2 component of a SOC or a ASIC. The SmartDV's RLDRAM2 memory model is fully compliant with standard RLDRAM2 Specification and provides the following features. Better than Denali Memory Models. Supports RLDRAM2 memory devices from all leading vendors. Supports 100% of RLDRAM2 protocol standard. Supports all the RLDRAM2 commands as per the specs. Supports for 8 internal banks for concurrent operation and maximum bandwidth. Supports Reduce cycle time (15ns at 533MHZ). Supports Non multiplexed addresses (address multiplexing option available). Supports Programmable READ latency (RL), row cycle time, and burst sequence length. Supports Balanced READ and WRITE latencies in order to optimize data bus utilization. Supports Data mask for WRITE commands. Supports Data valid signal (QVLD). Supports On-die termination (ODT) RTT. Supports IEEE 1149.1 compliant JTAG boundary scan. Protocol checker fully compliant with RLDRAM2 Specification. Models, detects and notifies the test bench of significant events such as transactions, warnings, timings and protocol violations. Constantly monitors RLDRAM2 behavior during simulation. Faster testbench development and more complete verification of RLDRAM2 designs. SmartDV's RLDRAM2 Verification env contains following. Complete regression suite containing all the RLDRAM2 testcases.